Herman Wald (1906 - 1970) was a South African sculptor. He was born in Hungary and studied in Budapest, Vienna, Berlin and London. He moved to South Africa in 1937 where he lived and worked until his death. 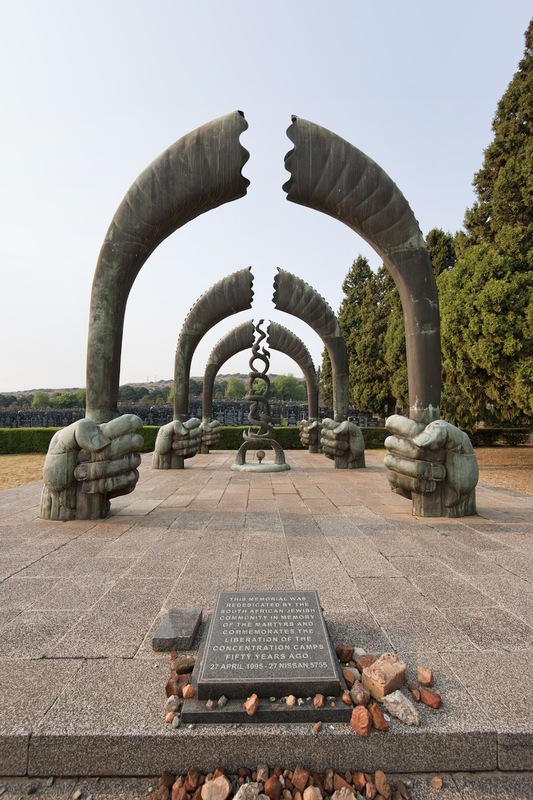 He was responsible for many large public works in South Africa at least two of which are perhaps peerless in significance: the memorial to the Six Million in West Park Jewish Cemetery and the Stampede in central Johannesburg. He also created almost 400 other works that are in collections around the world. Reflecting his origins, his domicile and age, the subject of his works include the Bible, Africa, Jews of Eastern Europe, portraiture, love, the family and anti-war themes. He made works for public spaces, homes, synagogues and theatres, modelling mostly but sometimes carving. He was born in Cluj, Hungary in 1906, to Rabbi Jacob and Pearl Wald. One of 8 children, he grew up in an atmosphere of old-world Jewish Orthodoxy, in the Chassidic tradition. The Jewish learning which he received from his father and religious teachers left a deep impression on his life and work. When he became interested in carving shapes and figures, he came into conflict with his father, to whom the religious injunction against graven images was a meaningful issue. So he continued his carving and modelling in secret. But when his pride in completing the larger-than-life bust of Dr. Theodor Herzl, the founder of the modern Zionist Movement, got the better of him, he showed it to his father. The Rabbi, impressed by the work, had to concede his son's talent, and he did not oppose Herman when he announced his intention of taking up art studies in Budapest. In 1928 he went to Vienna to join the studio of the famous Anton Hanock. He then went to Berlin to work and study with Totilla. The rise of Hitlerism, however, made it advisable for him to leave, and he went to Paris. From there he went, in 1933, to London. By the end of 1933, he had obtained a post at the Working Men's College, teaching sculpture. His own work won him praise and encouragement from Jacob Epstein. Meanwhile, his brother, Dr. Marcus Wald, had settled in South Africa, where he was appointed Minister to the Kimberley Jewish community. Marcus invited Herman to come to South Africa, and Herman immigrated in 1937. He settled in Johannesburg, where he established a studio, and met Vera Rosenbaum, whom he married in 1942, and had three children, Michael, Pamela and Louis. Wald volunteered for the South African Forces in World War II and served in the Engineers' Camouflage Unit. His war experiences led to a number of notable studies, one of which is now housed at the War Museum in Johannesburg. On his discharge from the Army in 1944, he re-opened his studio in Johannesburg and a period of great creativity followed. In 1952, Herman Wald left on a seven months' overseas tour, in the course of which he visited Israel, Rome, Paris, London and New York. Here he held an exhibition at the New Gallery, West 44th Street, New York, which won him praise in the American press. He returned to South Africa at the end of that year. 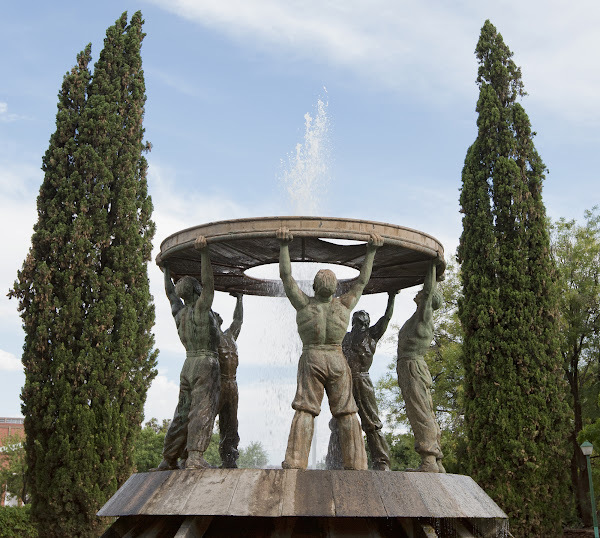 Among his many works were "Kria", memorialising the martyrdom of European Jewry - a twice life-size figure of a man rending his garments in mourning, which he created in 1949, and was erected in 1957 in the grounds of the Witwatersrand Jewish Aged Home in Sandringham. In 1956, he created the Monument to the Martyred European Jewry, which stands in the Westpark Jewish Cemetery, Johannesburg, and was ceremoniously unveiled at a special service attended by thousands in May 1959. 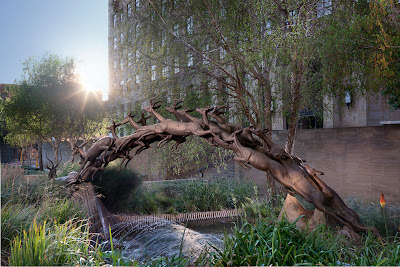 In 1960, he was commissioned by Mr. Harry Oppenheimer, to design and erect two fountains in memory of his father, the late Sir Ernest Oppenheimer, one in Kimberley, the "Diamond Diggers", situated in the Oppenheimer Memorial Garden at the Kimberley Civic Center, and the other in Johannesburg - a study of leaping impala, familiarly known as the Oppenheimer Fountain, in the center of Johannesburg. He was also commissioned to design and execute a work to adorn the Holy Arc of the new Berea Jewish Synagogue in Johannesburg. For this he created a symbolic study, "Wings of the Shechinah". Herman Wald lies buried in the Westpark Jewish Cemetery in Johannesburg, beside the massive monument he created to Martyred European Jewry. Herman Wald's work, which underwent various stages of development, shows a wide variety of interests. Generally, certain themes are repeated over and over. On the one hand there are the Jewish themes, largely Biblical, and (as in the case of Adam and Eve), repeated and developed from a heavy, rather literal study, to a passionate fourth version which, though strictly figurative, takes the Biblical theme as a point of departure and results in two figures which form intrinsically stirring volumes sculpturally; and the secular Jewish way of life, represented generally far more lovably - they are almost sketches, from a past so firmly established with Wald that it needs no laboring to demonstrate its realness to him. These are smaller works in size, not scale - depicting, in a rough but fluid texture, scenes from that past - " The Arguers"; "Tevya"; Schniftabak"; and more serious studies such as the "Blessing". On the other hand, there is a preoccupation with universal themes broadly divisible into several sections. One, the love-theme, happily, lustily and often ethereally developed, advancing from the strictly figurative for its own sake to, over the years, a suggestion of the monolithic where the sculpture at a distance is a column or a vague spiral, closely integrating the figures which are distinguishable as such closer up; others, “Mother and child”, “Man and woman”, “Self searching”, are all similarly repeated and rethought. Wald has also shown repeated interest in African studies, usually executed in wood, emphasizing the dignity of the Zulu warrior, and motherhood. As a portraitist Wald's skill and sensitivity are very apparent. The portraits are often monumental in feeling, though among them are a few showing a delight for caricature where the subject seemed to ask for it. Wald's monuments are to be seen in many South African towns, his feeling for the monumental shows in both large and small works. Herman Wald was a man of strength and warmth - no businessman – preoccupied with human values that he attempted to express in his work. He described his work as "sculpture with a literary content", something in the manner of Jacob Epstein. But his works stands as easily untitled, to be admired for their purely sculptural quality, as much as for the messages embodied in them.